Why choose Us for your European Auto Service? When you need advanced repair service for your European performance vehicle, bring your car to Euromotive Performance, a premier repair and maintenance shop near Fort Lauderdale and Miami. With factory-trained technicians, we are the dealer alternative for Mercedes, BMW, Porsche, Mini, and Bentley vehicles, as well as many other state-of-the-art European luxury and performance cars. Modern cars are loaded with advanced computer systems that monitor everything from vehicle timing to fuel mixtures. Through meticulous and advanced computer systems, vehicles are more precise, getting the best torque, horsepower, and handling from every ounce of fuel. However, fixing and fine-tuning these vehicles calls for a fully-trained specialist. At Euromotive performance, we will deliver advanced service for maintenance, brake repair, transmission repair, and more, ensuring your vehicle is running at peak performance, every time you pull out of the driveway! We use the manufacture recommended tools to diagnose and repair the issue, working under the same meticulous standards as dealership mechanics. We will use our factory training and advanced diagnostic tools to determine the exact problem with your vehicle. We’ll then repair the issue quickly, helping you get back to the road where you can enjoy your luxury European vehicle. So what’s the difference between our repair shop and a dealership? It all comes down to better service and better pricing. We deliver exceptional repair and maintenance service, treating you like a part of our family, not like another number. We will also deliver superior savings compared to the dealer price, all without sacrificing an ounce of quality, consistency, and repair excellence! Our repair and maintenance shop is conveniently located near I-95 in Hallandale Beach. This makes it the perfect location for drivers in Miami, Ft. Lauderdale, Plantation, Davie, Aventura, Florida and the sorrunding areas. Visit our 6,000-square foot modern facility and you’ll find a clean, organized, and high-quality repair location that is made for the most advanced and complex European vehicles. We firmly believe in meticulous repairs, affordable prices, and outstanding service. Give us a call at 954-944-2779 or fill out a contact form and we’ll reach out to you with more information. 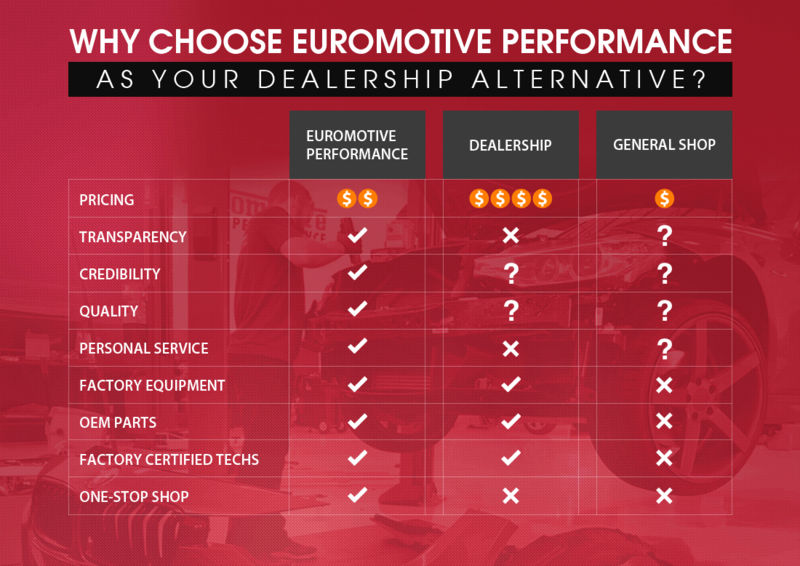 From tune-ups for better acceleration to brake repairs for safe driving, you can count on the knowledgeable experts at Euromotive Performance. Bring your Mercedes, BMW, Porsche, Mini, or Bentley to our location and you’ll discover why so many drivers in the Fort Lauderdale and Miami, FL areas choose us for repairs and maintenance on all European luxury and performance cars.